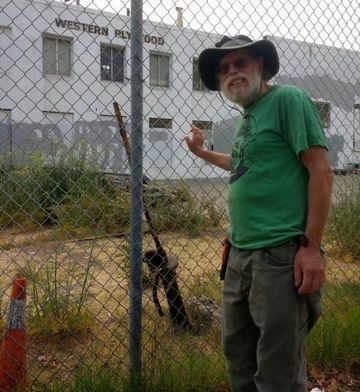 The fenced off diagonal lot that once was the route of the San Jose-San Francisco Railroad, here at the corner of 22nd and Harrison. Parcel 36 is a vacant lot occupied by a colony of feral cats, redolent with the scent of wild fennel and other, less pleasing odors. Two distinctive buildings stand on either side of the 22nd Street entrance: The wedge-shaped Western Plywood building and the Atlas Stair Company, a quaintly turreted building that wouldn’t look out of place in Disneyland. Just inside the chain-link fence that separates the property from the 22nd street sidewalk, an odd metal implement is embedded in the ground. Rusted and corroding, it merges vertically with the stalks of wild fennel which surround it. It’s an old railroad switcher. Next to it, sections of iron rail track are still visible. Although the 23,522-square-foot lot has been city property since 2007, there is no title or deed on file at the Office of the Assessor-Recorder of the City and County of San Francisco. For more than a decade, it has eluded both mention in the city rolls and an assessment of its taxable value. Consequently, it has never been taxed. The lot twists in a southwesterly direction and emerges on Treat Street, next to a fenced-off cottage. Both Western Plywood and the tattered cottage are already part of the Mission’s past. Both buildings are slated for demolition and, by next year, two four-story residential buildings will rise on the footprint of Western Plywood and 953 Treat Ave, encasing Parcel 36 between them and partially erasing it from sight. Vacant lots are often seen as desolate, vaguely menacing places. Tree Rubenstein, a Mission resident for 30 years and an award-winning urban gardener, sees Parcel 36 differently. Where stalks of wild fennel now grow, Rubenstein envisions orchards of fruit trees and raised garden beds. He knows of what he speaks. 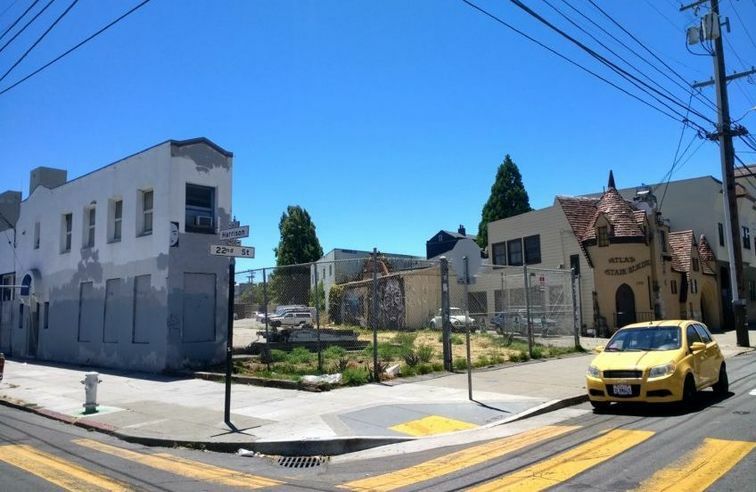 A decade ago, Rubenstein successfully lobbied the city to create Parque Ninos Unidos, on the site of an old building materials site on the corner of 23rd and Folsom streets. The park’s northeast corner hosts an urban garden and the Sunday Free Food Farmstand. Rubenstein sees no reason that the weedy, litter-strewn lot across the way shouldn’t have the same fate. Parcel 36 started life in 1860 as the right-of-way for the short-lived San Francisco and San Jose Railroad Company. According to train historian Dennis Evanosky, the railroad was built to carry passengers and freight — crops, mostly — from San Jose and ten other peninsular cities to the port of San Francisco. It made stops at stations in Bernal Hill and the Mission. Old railroad switch, mysteriously hacked off in early January 2018 after this article appeared. 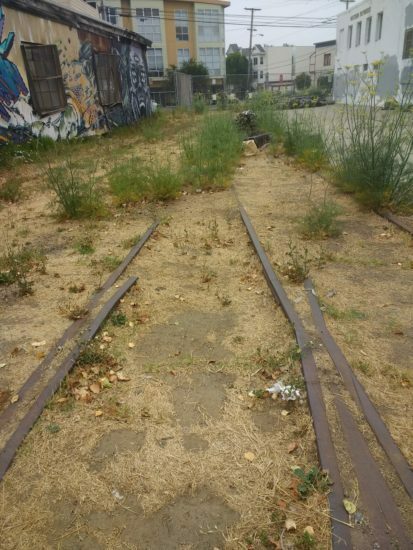 Two San Francisco parks, Parque Ninos Unidos and Juri Commons, between San Jose and Guerrero, owe their existence to the railroads. The city has taken note of this history and has, to some extent, concurred with Rubenstein’s vision: In a 2010 draft document, the San Francisco Planning Department refers to Treat Avenue as “railroad row” and contemplates turning the wedge-shaped junction of Treat Avenue where it intersects with Harrison Street into a plaza that acknowledges and “celebrates” the old railroad corridor (pdf). In housing-starved San Francisco, land usage and productivity get measured in ways that have nothing to do with the yield of a fruit tree. It wouldn’t be surprising if the owners of Parcel 36 are entertaining development offers. Rubenstein and other neighbors would like to know. But there’s one problem. No one — not the Planning Department and, until recently, not the San Francisco Assessors and Recorder’s office — knows who owns Parcel 36. Because railroads are designated as utilities, the parcel was overseen by the California State Board of Equalization until 2006 and was last appraised by them, that year, for $1,242,890. According to Jack McCool, Supervising Property Appraiser at the Equalization Board, property assessments are done on “behalf” of California’s 52 counties. It’s up to San Francisco County Controller’s office and the County Tax Collector to prepare and deliver the actual bill. This never happened. According to Roberto Mercado, Senior Administrative Analyst at the San Francisco Office of the Controller, no tax bill was ever sent to anyone by the County Controller’s office. No taxes were ever paid. Carmen Chu’s office has confirmed that it is opening a potentially year-long investigation, with the help of the city’s attorney, to untangle the history of the property. Untangling that history will not be easy. The vexing question of who owns it needs to determined first. There’s no mystery about the first owner of the parcel. That was a man named John Center, an immigrant from Scotland, called the Father of the Mission in his 1908 obituary. Center arrived in San Francisco in October 1849, two months before the end of the first fabled year of California’s Gold Rush. Center concluded that his time was better spent supplying the city with produce and began purchasing real estate in the Mission District. In an early version of Rubenstein’s vision, Center planted gardens and orchards across the “fertile plain” of the Mission District, using Mission Creek for irrigation and cultivating apple and peach trees, strawberries and onions — all highly desirable produce in a city where San Franciscans often lived on beer, biscuits and salt pork. The profits of his gardens and orchards allowed Center to go on a spending spree in the Mission District. 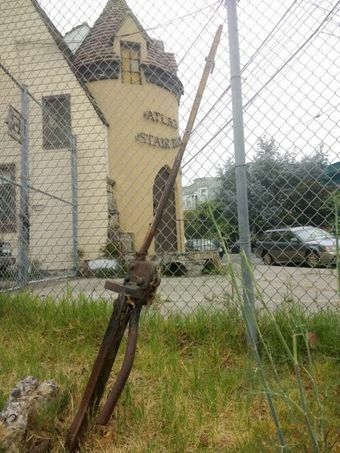 “There is scarcely an abstract of title to a Mission Lot upon which his name does not appear,” remarked Horatio Stoll, a San Francisco Call reporter, who claimed that Center once cleared $30,000 in one year from one acre of onions. One of the lots that Center purchased was located within the former precincts of the Union racecourse, which encompassed Mission, Harrison, 19th and 24th streets. In the early 1860s, Center subdivided this land and sold the lots at a profit. However, he held onto some of the land. He was looking for something other than his orchards for wealth, foreseeing correctly that transportation was the key to a profitable future. Center had already constructed two plank roads that wound through the mud flats of the San Francisco Bay and into the Mission District, and had invested in the North Beach and Mission railroad company. In 1860, he and 11 other men invested in another: the San Francisco and San Jose Railroad. Three years later, Center donated the land between 22nd, 23rd and Harrison Street and Treat Avenue to the railroad. It turned out to be his least profitable investment. The railway made no money. In October 1870, the Southern Pacific Transportation Company, whose monopolistic tendencies earned them the moniker “the Octopus,” snapped up the San Francisco San Jose Railway company. Center was the last clear owner and possessor of a deed. Today, only wildly contradictory information about the real owner exists. According to Gina Simi, communications manager for the San Francisco Planning Department, the Southern Pacific Transportation Company (SPTC) owns it. This isn’t possible: that company was acquired in 1996 by Union Pacific Railroad Corporation, a publicly traded company. In 1991, a man named George Allen Center filed a quitclaim on Parcel 36, granting it to Earnest and James W. Heinzer, presumably the same “Heinzer” noted on the Statement of Land Use Change form on file with the state. Quitclaim deeds are dubious instruments for granting property, a sort of hedged bet or admission that there may be other claims on the land and that the possession of the property isn’t “warranted,” according to Michael Barnacle, Head of Zephyr Realtors Association. The two Heinzer brothers who own property on Treat Avenue, with its own 215-foot rail spur, have a contentious and litigious history with federal and state regulatory agencies and the Union Pacific railroad. In the early nineties, the Heinzers engaged in a protracted dispute with the Southern Pacific Transportation Company (SPTC), which was trying to end service on its line in San Francisco. California Public Utility Commission documents show, remarkably, that the SPTC ran a train providing freight service through the Mission District until 1990. Known as the “Old Main Line,” the last Southern Pacific train in service in San Francisco rumbled down Harrison Street, limping to a profitless end. That fate became certain after its best customer, Best Foods, closed its processing plant on Florida Street on June 30, 1990.
Business on the freight line plunged from 349 carloads a year in 1988 to just six in 1990. The only customer left in the Mission was Ernest A. Heinzer and Sons Company, which since 1953 had manufactured furniture at its factory, a green concrete warehouse located at 933 Treat avenue. The Heinzer Company had been receiving shipments from Southern Pacific for 40 years, but those shipments were shrinking. The CPUC estimated that the Heinzers only received freight five to seven times a year between 1981 to 1988. In 1989, the Heinzer Company received one last shipment from the railroad. Faced with the loss of demand, Southern Pacific had made a pragmatic decision to stop freight operations. James W. and Earnest Heinzer immediately filed a lawsuit against the SPTC with the California Public Utilities Commission in June of 1991, alleging that the financially beleaguered railroad was illegally abandoning its track agreement with them and, moreover, that the the entirety of the Old Main Line should be considered as an extension of the Heinzer’s 215-foot private rail spur — and therefore not open to abandonment by the SPTC. Neither the commission or the Interstate Commerce Commission found this claim to be true. Moreover, the CPUC decision found that the Heinzers were allowing two other businesses which edged the parcel, the Western Plywood Company and Surber & Associates, to use their spur, hoping to artificially boost the number of freight deliveries on the line — and contesting the Southern Pacific’s claim that business on the line was so scant as to be “vestigial.” The Heinzers, like the other businesses, had been receiving the majority of their shipments from “motor” freight throughout the eighties. According to Southern Pacific’s plaint and the utility commission’s findings, the Heinzer brothers wanted one of two outcomes: either Southern Pacific should be forced to continue delivering freight, or it should sell them the right-of-way. Southern Pacific offered to sell the Old Main Line to the Heinzer brothers for $3,536,950 million if — and only if — the brothers took responsibility for track maintenance and the business of running a freight train. In return, the Heinzers offered $11,950 for the right-of-way, which was valued at $2.5 million by the commission. The Heinzers lost their case with the California Public Utility Commision and the Interstate Commerce Commission, which granted the Southern Pacific the right to discontinue service. This didn’t deter the Heinzer brothers. Four months later, in October of 1991, they filed the quitclaim to the parcel, paying no transfer tax at the time of filing. Sixteen years later, they may have purchased it for an undisclosed sum of money from Union Pacific. It will be the work of the Office of the Assessor-Recorder to locate this deed — and the owner. Since then, the lot has been used informally as a sort of social and financial commons by surrounding businesses. Tenants of the Heinzer warehouse have access to the parcel. The concrete deck that used to be a loading dock is now in use as a patio, complete with deck chairs. Tenants of the Heinzers use the weedy grounds for recreation, and are often seen by this reporter kicking a soccer ball around the old railroad tracks. Some business owners appear to be making a profit from the parcel, despite having no publicly recorded right to or claim on the land. The Safeway Roofing and Siding Company, owned by a man named Eldon Verette, charges the Little Giant Lighting and Grip Company “rent” to park their trucks inside the gate that fences off the parcel on Treat avenue, according to an employee of the Little Giant Lighting and Grip Company who wished to remain anonymous. It’s not clear how Safeway Roofing obtained the right to rent parking spaces within the parcel, nor how many individuals or businesses controls access in and out of the place. Emails and phone calls to James and Ernest Heinzer, and the Safeway Roofing and Siding business, were unanswered. The past of Parcel 36 — railroads and fruit orchards — could inform its future. There’s strong neighborhood support for conserving open space as density and infill creep into the Mission District, and a belief that all needs, commercial and communal, need to be carefully weighed as priorities shift and emerge with each new building development.